Everyone is excited for Pumpkin Spice season, but before unpacking the latest pair of boots, scarves, and sweaters, take some time to focus on something more exciting: NCAA Women’s Volleyball! The emergence of new TV networks and online streaming has helped broadcast volleyball matches for young fans to watch their favorite players and teams. The next generation can now learn from the best and try to emulate the players that they hope to be like someday. Other mainstream sports in the US have had the luxury of being televised. Kids all of the US are trying to juke defenders like Messi, trying to hit 50 foot jumpers like Steph Curry, shoot like Vladamir Tarasanko, or hurdle a defender like Cam Newton. Now that volleyball is televised, volleyball athletes should take time to watch the best in the US, or stream some of the best in the world. Players learn by watching those better than them. It sparks creativity and reinforces teaching techniques. These athletes are great models of the way the game should be played and fosters more excitement and growth for volleyball. While there is no complete list of matches on TV this year, check the networks on your TV provider. Basic cable will have a few channels showing matches or you can upgrade to a premium version for more matches. Another option is to check on the websites of your favorite schools. Most universities stream their matches online for free. It is a great way to get better at the sport you love without adding extra fatigue into a busy high school or grade school schedule. Boys, if you don’t want to watch women’s college volleyball, stream some professional matches online. The following networks frequently show matches in the fall: SEC Network, Big Ten Network, Longhorn Network, ESPNU, ESPN3, Fox Sports 1, and the Pac 12 Network. To check out professional matches, go to: laola1.tv and select the Volleyball tab. 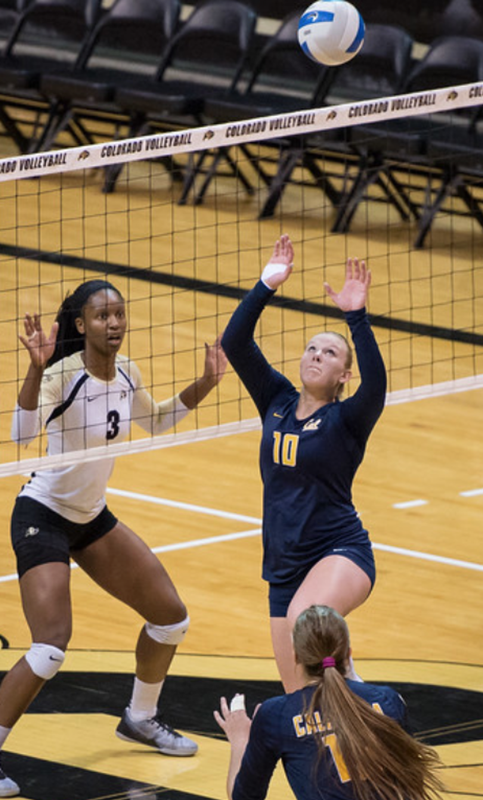 Alumni, Alyssa Jensen is off to a strong start setting for Cal-Berkeley this year!